Online shopping is booming and expected to get even bigger, with some experts predicting that retail e-commerce sales will nearly double in the time between 2016 and 2020. But even as all those digital carts fill up, there’s still some hesitation when it comes to buying perishable products like meat online. Unlike with shelf-stable food items, buying something like steaks online can prompt concerns about shipping delays, food safety, and quality—especially since you can’t physically see the items you’re purchasing the way you can when standing in the meat section of a grocery store. For a truly great steak, you need great ranching strategies—the kind that respect and preserve the lineage of each cow in the herd and focus on humane treatment and stress-free environments. You want happy cows. As esteemed food writer Michael Pollan points out, meat eating has become riddled with moral and ethical ambiguities, but eating a steak that comes from cows given grass and sunlight should be something to defend. That means when you buy steaks online, the treatment of the cows shouldn’t be information that’s tough to find on a company’s website. Just as herd management matters, so does info about quality and how a company defines that term. Simply saying that a steak is “grade A” or “high quality” isn’t nearly enough. It’s like asking how someone is doing and getting the answer, “Fine.” Not much real insight there. 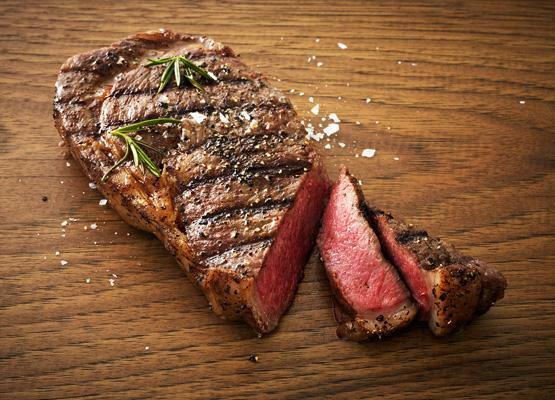 A company that sells steaks online should be able to articulate what goes into that quality assessment, such as texture, marbling, and flavor, in addition to their place within the USDA grading system. For example, Wagyu beef often exceeds the top grade. This is a tricky one, because every company will probably tell you that you’re getting a great value for the price. That’s why it pays to dig a little deeper and understand realistic price drivers like limited availability, highest-grade quality, and sustainability practices. People sometimes ask us why Wagyu seems so expensive, for instance. We have a more extensive answer at this blog post, but in short, it’s the rarity of the beef and the craft required to proficiently raise the breed that gives this type of beef a higher price point than its commercial counterparts. With perishable items like beef, you absolutely need to know what’s going to happen between clicking that “purchase” button and getting your delivery. A good company should be clear about how it ships, when you can expect your order, and what type of packaging is used to ensure freshness. Take a look at the U.S. Department of Agriculture’s fact sheet on what you should look for in a company’s shipping policy when buying perishable foods. Testimonials from customers can often be helpful for buying decisions, and getting steaks online is no different. A company is likely to have a presence on social media like Facebook and Instagram, and customer comments often give insight into what makes people delighted—and what doesn’t. In general, buying steaks online, or other cuts of beef, is definitely different from placing an online order for clothes, books, or household items. But by doing a little research and making sure a company meets all the items on this list—a bit of a humblebrag, but Lone Mountain Wagyu qualifies—you can be assured that what’s in your digital cart will be perfect on your plate, too. Perfectly cooked steak is a thing of beauty. That’s why it’s so important to know proper cooking methods to ensure that your passion gets to the plate.